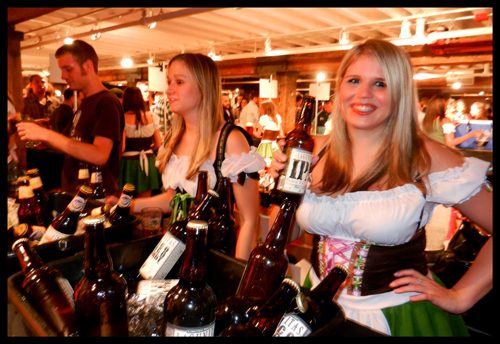 A big crowd was on hand for the 150 different international and craft beer variations offered up by a group of cheery dirndl clad young women at Das Best Oktober Fest Beer Festival which took place in midtown at La Venue Saturday. The day was split into two sessions with an optional day-long pass and for the ticket price, party goers were handed a souvenir tasting upon entering and were free to sample the vast array of beers as well as wines and spirits. The drink options ranged from well known German beers such as Hofbrau Oktoberfest and a selection from the oldest brewery in the world, Weihenstephaner Festbier, to known American favorites like Sierra Nevada Pale Ale and Flying Dog Dogtoberfest to local brewers like the Bronx Brewery’s Pale Ale and Blue Point’s Rastafari. But the event wasn’t just about drinking. To get the real “viel gemutlichkeit” experience, attendees had the chance to enjoy one of the many live Polka, Klezmer, and Oompah bands, try some of the authentic German food ranging from brat with gourmet fries to foot long pretzels, or participate in one of the competitions like the beer belly or Miss Oktoberfest contests. The event was a good time all around and considering the number of people attending, the rooms never felt too overcrowded and the lines for drinks remained pretty short and swift. 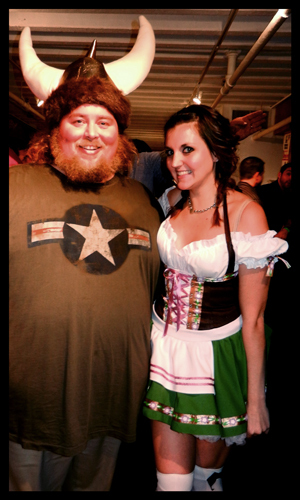 In all, Das Best Oktober Fest lived up to its name and whether you came decked out in lederhosen or just pre-gaming Saturday night on the town, it was wunderbar!